If You Blew $50 on Duke Nukem Forever, Would You Blow $300 On This? 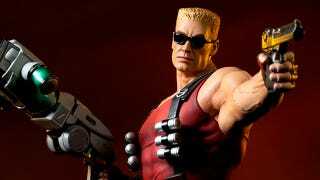 It's been over a year since Duke Nukem Forever was released, and to commemorate (commiserate?) the whole experience, Sideshow is next year bringing out this 16" statue of the Duke. Selling for USD$300, he's certainly not cheap, and given the reception to the last game in the franchise, may seem entirely unwarranted. But then, there's the beauty in leaving the character himself largely unchanged between games. Fans of Duke 3D or even the originals can get this and, if they ignore the contemporary enemy corpse embedded in the base, pretend this is 1996's most advanced and expensive adult collectible based on a video game.